11.354 photo-fragments, 264 shooting hours, 15.963 people depicted. Just a few statistics of Rivus Altus. 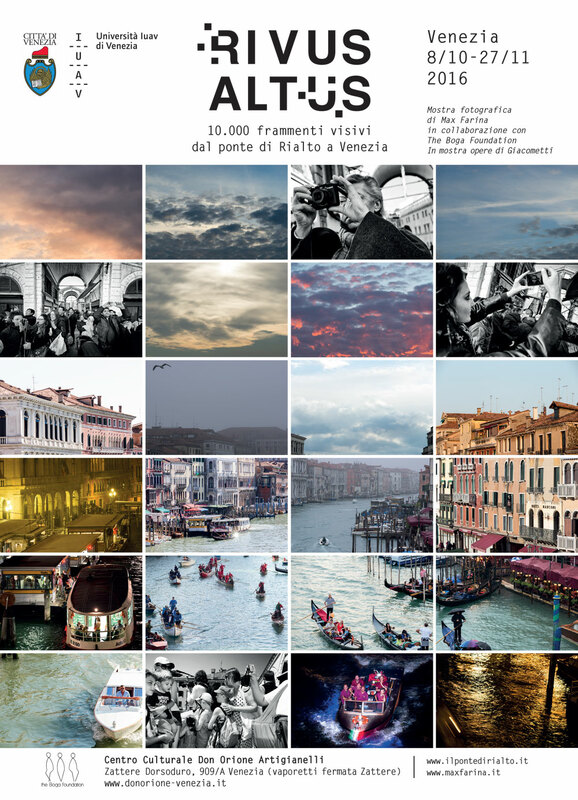 The photography project that reassembles an innovative concept of the most popular Venice postcard: the view from Rialto bridge. Massimiliano Farina, architect and photographer from Milan, looks into the definition of stereotype as a simplified and popular vision of a place. Over two years of photography from the same position, day and night, with the aim of creating a new image of the skyline from two different viewpoints: the Panorama and the Observers. Decomposing and recomposing, approaching or moving away thousands and thousands of fragments made of light, shadow, silence and noise, the user can invent its perfect and unique panorama, intereracting in the exhibition space. The author provides a complex vision of the panorama and follows the same approach to depict the “Rialto people” , captured with a simultaneous shutter click of two different cameras. The photography couples are printed in black and white to distinguish the observers point of view.